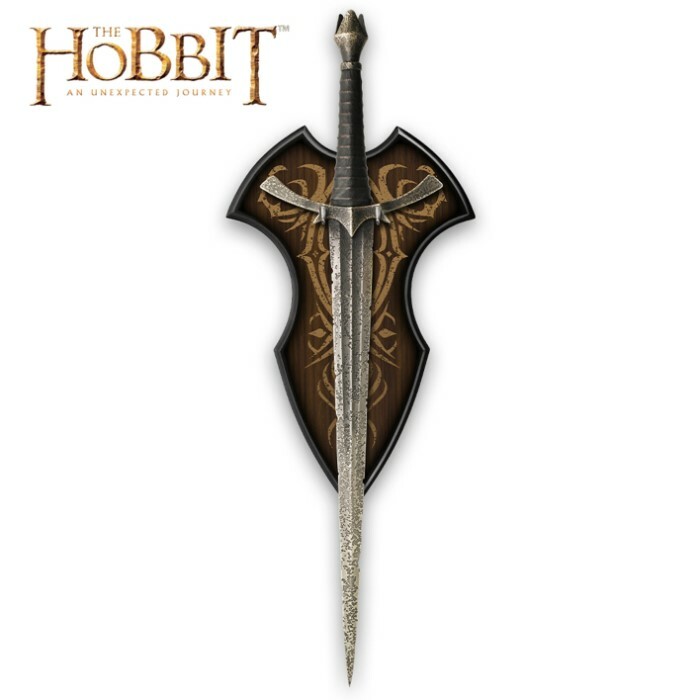 Blade Length: 17 ½"; Overall Length: 25 1/8"
Officially licensed replica from The Hobbit series. The 17-1/2" blade is crafted of AUS-6 stainless steel with an aged, distressed finish just like the original filming prop used in the series. The double-edged blade is sharp and culminates in a ferociously sharp tip. 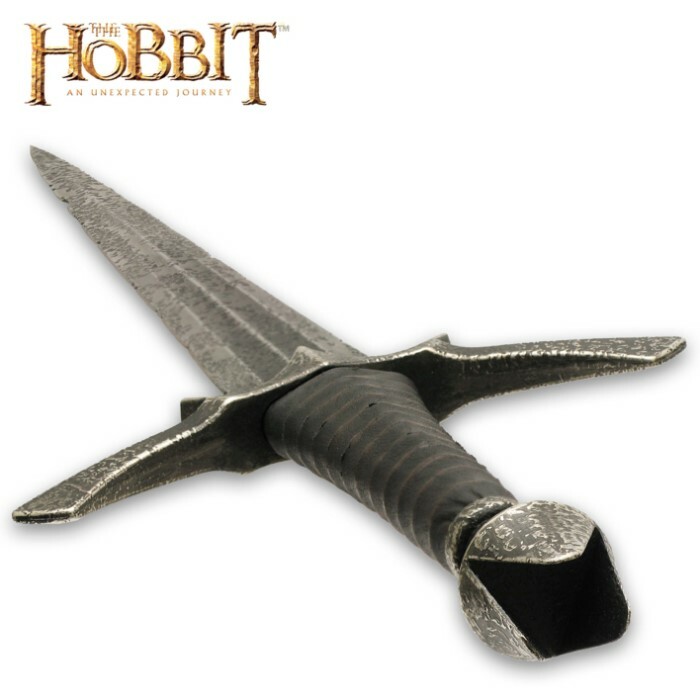 The Morgul Dagger, Blade of Nazgul features solid metal hilt parts and a leather-wrapped grip for additional authentic details. It comes with a wood wall mount display plaque. Measures 25-1/8" overall. Not having owned the original UC LOTR Dagger, i cannot compare the two. Firstly, i took off 1 star because i just did not like the feel of the leather wrapped handle. It feels... thin / "papery" - as though i'd be scared i might tear it if handling the dagger too often. I took off another star because the blade weathering could have been done better. I do like the pitting, but wish the patina / blade itself was a little darker, to match the Witchking sword and helm... Overall the dagger feels very light in the hand... a little too light for a dagger of this size. On the plus size, the dagger is a great piece to be displayed next to the other Witchking prop replicas. I still recommend it to those looking to round off their collection. Especially due to all the screen time it gets - it does look good! This sword looks and feels great. The quality put into these swords is unbelievable. It is well worth the money. You get more than what you pay for with these UC replicas. 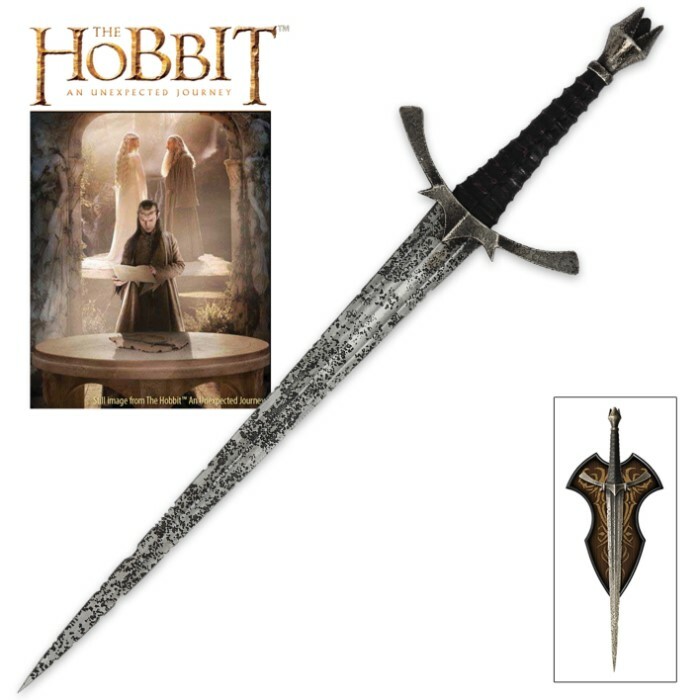 Just recently purchashed the hobbit Morgul dagger blade of Nazgul and all i can say is WoW what a great piece for any collection i would highly recomend it to any one who likes Hobbit blades!!! Very fast shipping,blade came in great condition and i am very satisfied with the product and well worth the money. It is a great piece to add to any collection. This is a very convincing reproduction of the Morgul blade of the Nazgul, the blade that Frodo was stabbed with on Weathertop. It is made of steel, with very good aging and a good handle that could be wood or leather, hard to tell. It is conveniently small so it is easy to display. The point is still sharp.